Forget about the queues at the ticket office: Buy your tickets on-line! 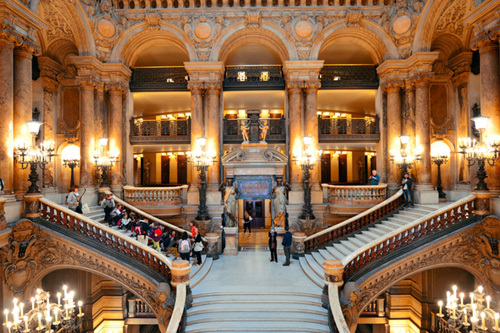 The Opéra Garnier is renowned world-wide for its charm, its air of mystery and its unequalled beauty. We are talking about one of the most beautiful theatres in the world and without doubt, one that has the richest and most magical history. In fact, after the famous novel by Gaston Leroux, "The Phantom of the Opera," the theatre actually became known as "The Ghost Theatre," but its original name, however, is the most well known and most commonly used. The origin of the theatre's name is derived from that of the architect who designed this imposing structure at the behest of Napoléon III, Charles Garnier. The Opéra Garnier is a Parisian icon which characterises the IX Arrondissement. The building's beauty makes an immediate impression on every passer-by with its numerous multi-coloured marble friezes, its columns and statues that are mainly representations of the Greek gods. Its exquisite and elegant interior is also extraordinarily spacious - in fact, we are talking about one of the largest theatres in the world. Amongst the main features which undoubtedly have an impact on every visitor are the vast staircase and the auditorium's famous ceiling by Chagall. The ceiling takes its name from the fabulous art-work by Marc Chagall which pays tribute to the 14 most famous composers in the world and in its centre, hangs a massive and majestic chandelier weighing 7 tons. Unrestricted entry for whatever time you wish. The Foyer de la Danse. On the day of your visit: show your tickets on your smarfphone and Jump the Queue. There is no timetable to abide by, you can enter whenever you wish between 10:00 and 16:30. The theatre of the Opéra Garnier is situated on the square of the same name, Place de l'Opéra, in the IX Arrondisement. In order to reach the theatre, you can use Lines 3, 7, and 8 on the Metro and will need to get off at the "Opéra" stop or, via the bus on lines 20, 22, 52, 42, 68 and 81.